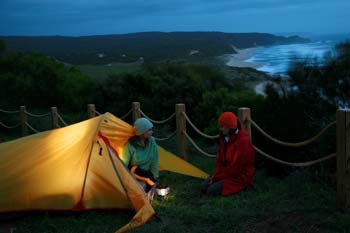 Walk the whole track (100km) in 6 days and spend five nights in some great camping spots. Our trailer (containing your gear) as close to the campsites as possible. Please read the itinerary below for instruction details on each day's walk. Please note day 4 you carry your gear & on day 5. On day 6 you backtrack by 1.5km to drop your gear in the trailer. Food. You purchase your food before you arrive, or in Apollo Bay on your arrival. Apollo Bay has 2 supermarkets and a fruit & vegetable store. On the first day of your walk, you leave your food (for the duration of your whole walk) in our trailer. There are no shops on the track. You finish your walk at the 12 Apostles on day six at 3pm. We return you back to Apollo Bay. 1) Check that there is availability first by checking dates on our booking button. Day 6: Saturday - no site required. Transfer to Apollo Bay from the 12 Apostles included. Day 6: Monday - no site required. Transfer to Apollo Bay from the 12 Apostles included. We will place our trailer as near to the campsites as possible, but due to the amount cars in the car parks in busy periods we can only get the trailer as close as space allows. Please look around for the trailer if you cannot see it immediately - it may be tucked behind a car or two! Please note on this day we cannot get into the campsite as there is no road/track access, so you need to carry your gear and food. You, therefore, carry your large rucksack and leave your small day pack in the trailer whilst you don't need it and anything else you do not wish to carry. Day 5 - (13km) Ryans Den, via Wreck Beach to Devils Kitchen. You carry your large rucksack. At approx 4.30pm we leave a trailer at Wreck Beach Car Park, with water and your food items you choose to leave with us at the start of your walk. Once you have replenished your supplies you walk on to Devils Kitchen for 1.5km. Day 6 - (16km) Devils Kitchen to 12 Apostles. You carry large rucksack to the 12 Apostles, OR you have the option of walking back to the trailer at Wreck Beach Car Park (1.5km) to lock up your large rucksack before walking on the 12 Apostles with only your day pack. We meet you at the 12 Apostles with your large rucksacks at strictly 3 pm. Walk 91 drive you back into Apollo Bay by approx 5.30pm. Please wear appropriate clothing, comfortable walking shoes or boots and bring a couple of 1, 2 or 3 litre refillable water bottles. Please only bring a lightweight one or two man tent, or maximum a small three man tent. Only one tent is allowed per site booked. Please also note that if you arrive early at the 12 Apostles you must wait for your pick up / transfer as times advertised. If you are fast walkers, pace your last day's walk. Enjoy your campsite in the morning before you set off on your walk to avoid a long waiting time at the 12 Apostles. CHILDREN: Please note all children require their own seats (by law cannot sit on laps) & child 'insert' seats must be provided by the customer where Australian laws apply. GOR shuttle do not provide child seats. Please contact us if you wish to book small children/ infants onto this trip. 1 x Trangia & 1 x one litre bottle of fuel, basic lightweight plates, cups, bowls/cooking utensils $70.